We were recently asked to complete a project for a client around inclusivity, which included an exploration of terminology around disability. When we kicked off the project, we ended up having quite an academic and frankly, quite clumsy debate around terminology; what’s appropriate, what’s patronizing, what’s outdated etc. So where do you go for some real and genuine insight about disability? You go straight to Baroness Tanni Grey-Thompson, who recently initiated one (of many) public discussions around the term ‘disabled’ on Twitter. Grey-Thompson tweeted that she disliked the way in which the term ‘disabled’ had recently been presented to her as ‘disABLED’ (i.e. ‘dis’ in lower and ‘abled’ in upper case). Summing up her gripe with the term, she said: “I dislike the capitalised ABLED. I’m a disabled person. Don’t need a non-disabled person telling me I’m OK.” Grey-Thompson herself has no issue with the term ‘disabled’, when written all in the same case. What do we think? Well, speaking purely from a design perspective, ‘disABLED’ is a bit of an embarrassing visual stunt in our opinion: a typographic ‘no no’. In her tweet, Grey-Thompson prompted a Twitter debate around the term ‘disabled’ more generally, with some coming out in favour and some against. One Twitter user explained that where the first part of any word contains ‘dis’, it is typically a negative term. Another pointed out that a disabled person is not ‘disabled’ per se, but instead, they are disabled by society, and by the prevailing social model. On this basis, any inherent negativity within the term reflects our society’s shortcomings, rather than being a negative badge or label. As a recent convert to disablism myself – through a traffic accident – I personally dislike the word ‘disabled’ full stop. I still have 40 years of ableness under my belt that I’m not about to dismiss just because of one lousy accident. I’m not disabled; I just use a wheelchair now. When you’re in rehab in hospital, next to a person who can’t feed themselves, I found it disrespectful to them to call myself disabled. And there’s the problem: defining ourselves and others without causing offence. Amongst alternative terms that Twitter users highlighted as being in use are ‘differently abled’ and ‘alternatively abled’, which received a mixed response. Some also questioned the necessity for any kind of label at all. In my opinion, it does require a label. Here’s why. Dreary every day tasks for an abled bodied person can be huge victories for an amputee, a blind person, or a stroke victim. And those victories end up defining us and need to be recognized. So yes, label me. But don’t patronize me. The Twitter discussion also ventured (in a slightly tongue-in-cheek way) into the way the term ‘disabled’ is applied to physical facilities. Twitter user @annielpool pointed out that “Disabled access is an oxymoron. Things are either accessible or not. Don’t use medical terms re our bodies and minds.” Another, @safc4ever, opined that “a disabled toilet can’t be used, as it is disabled”. And a couple of real life examples of alternatives to the term ‘disabled toilet’ were given – see left. 1. 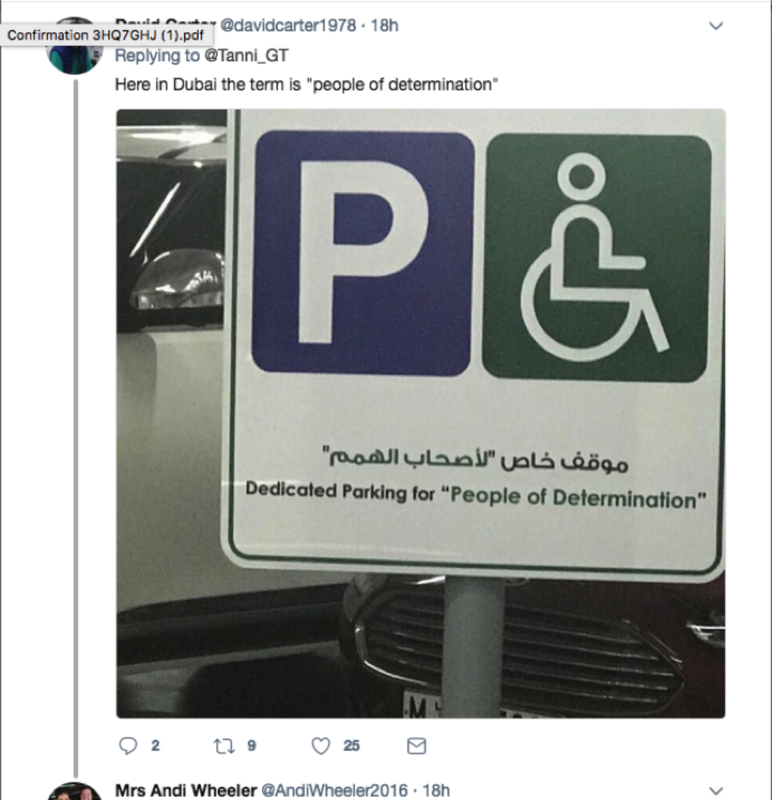 This Dubai car park has signs reserved for ‘People of Determination’. Personally, I think that captures me perfectly. But you bet it’ll upset someone, somewhere. 2. 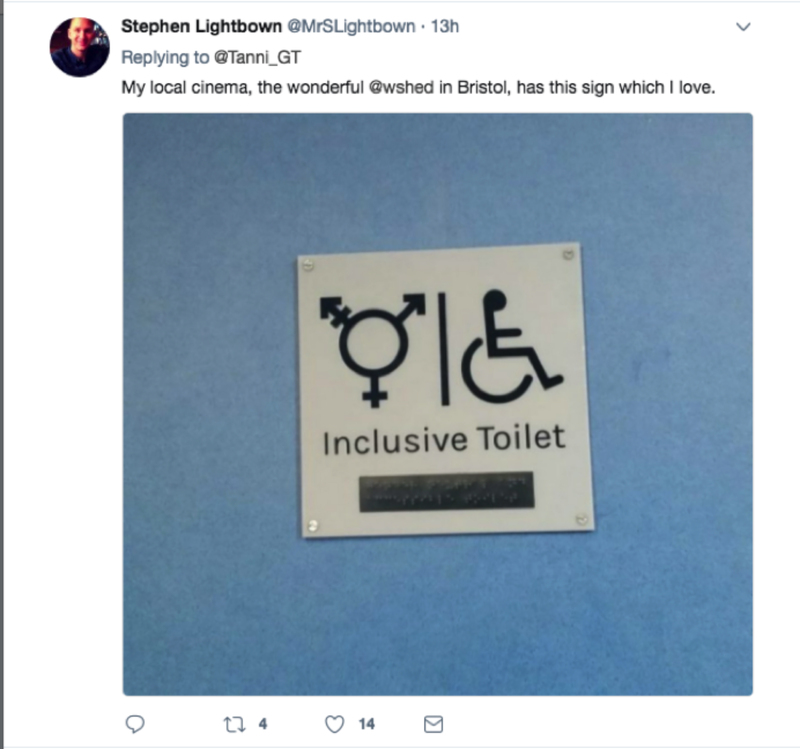 And the Bristol ‘Inclusive Toilet’ sign at least addresses @safc4ever’s gripe, above. The discussion has given us serious food for thought, particularly as we design wayfinding, signage & navigation and advise on the terminology that goes with it.